When up in the mountains of Pennsylvania, you don’t expect to stumble into a climate more commonly found in the rain forests of the Caribbean or Central America. 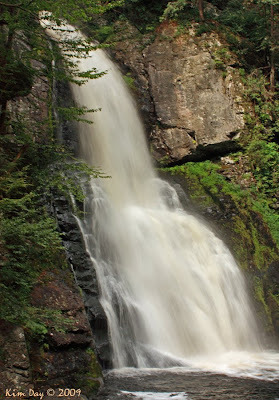 But, as soon as we hit the hiking trails at Bushkill Falls, the pleasant 75 degree August day turned tropical, fed by the moisture from a series of 8 waterfalls. I’d hate to be there when the temps are in the 80s or higher. The “trails” at Bushkill are a series of wooden walkways that line the sides of the waterfalls and bridges that cross them. The stairs that take you from the upper to lower falls are very steep. But, the close up views of the falls make it worth it. Well, until you have to climb back up them on the other side. Then, it’s helpful to be part mountain goat–particularly when you have to climb over slippery exposed roots in the few areas where there are dirt paths. I hope to go back this fall. I suspect that the falls will be really gorgeous once the leaves start to change. But, I leave you with one more picture of the stream that eventually because the roaring falls above. This entry was posted on Sunday, August 9th, 2009 at 12:40 PM. 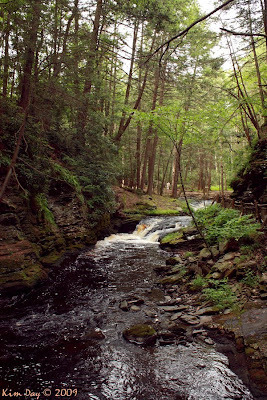 It is filed under Poconos, US and tagged with Bushkill Falls, hiking, Waterfalls. You can follow any responses to this entry through the RSS 2.0 feed. In my opinion there are searvel things that make this a good image.First, the setting within the firs. This perspective is striking and different from most waterfall images.Next, the sharpness and detail visible in the trees. It is crisp and well focused. Lastly, your choice of high contrast processing makes fine highlights in the trees stand out even more. Looks great in black and white.